Reliance Ranches had two more standout youngsters work on Thursday, April 11 when the Utah-bred colt Needs No Intro and the Oklahoma-bred colt Old Blue Shirt covered 220-yards evenly in a time of :12.30 - the co-fastest times of the morning. Trained by Mike Robbins, Needs No Intro is by the great One Famous Eagle (photo) and out of Separate Fire, the champion 2-year-old filly in 2011. She won the 2011 Grade 1 Kindergarten Futurity and Grade 1 Ed Burke Million Futurity. Sired by Walk Thru Fire, Separate Fire is the mother of Separatefromothers, the winner of the 2018 Cowboy St. Futurity. Also sired by One Famous Eagle, One Blue Shirt is out of the Corona For Me mare Back In The Pack. 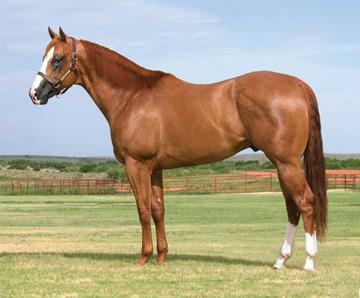 Bred by James and Marilyn Helzer, Back In The Pack won four races and $131,831 in her career. As a 2-year-old, Back In The Pack won the 2011 All American Juvenile Invitational and was second in the Ruidoso Futurity. The following year, Back In The Pack qualified to the Dash For Cash Derby. Ed Allred was represented by two sharp juveniles on Thursday in the Kiddy Up colt Best Yet and the Stel Corona colt Sounds Good. Trained by Scott Willoughby, they both covered the 220 yards in :12.4. Best Yet is out of Better Be Good, who is a daughter of the outstanding mare How Good ($40,525). How Good is the mother of 2019 La Primera Del Año Derby finalist No Telling, 2019 Cypress Handicap winner Well Good and 2015 Champion of Champions finalist Well And Good. Sounds Good is out of Ynot Win, the daughter of the highly productive mare Ynot Bar ($136,480). She’s the mother of Dont Pass Bar, the dam of 2015 AQHA champion aged mare Quirky, and Ynot Walk, the winner of the Grade 1 Los Alamitos Winter Derby. Trainer Chris O’Dell worked a pair of juveniles with superstar bloodlines in the form of Favorite Lady Melania and Runforyourlife. Favorite Lady Melania is a filly by Favorite Cartel and out of the top producer Another Wise Lady. She cruised to a :12.6 clocking from the inside post on Thursday. Favorite Lady Melania is a half-sister to 2018 AQHA champion 3-year-old filly A Political Lady, the winner of the La Primera Del Ano Derby last year. Favorite Wise Lady, who ran second in the 2018 Governor’s Cup Futurity, is a full sister to Favorite Lady Melanie. Jockey Eduardo Nicasio never pushed Runforyourlife in his work on the way to covering the distance in :13.0. Sired by Favorite Cartel and out of Remember Me Rose, Runforyourlife is a full-brother to superstar Powerful Favorite, the winner of the Grade 1 Los Alamitos Winter Derby and El Primero Del Año Derby in 2019 and the Governor’s Cup Futurity in 2018. The mare Remember Me Rose also produced Grade 1 finalists The Revenant, Remember The Rose and Remember To Dash. To view all of the morning gate works at Los Alamitos, visit losalamitos.com. For more, e-mail larace@losalamitos.com.